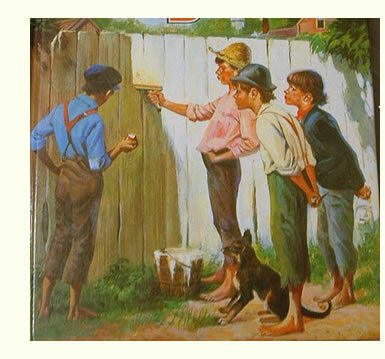 Do you remember the fence painting scene in Mark Twain’s Tom Sawyer? There are some lovely images of this on the web page. Tom has been given the task of painting a rather lengthy stretch of fence. A boy watches him and begs to have a go as Tom uses slow and deliberate strokes to make the job look interesting and exciting. Tom agrees for a number of marbles in exchange and somewhat reluctantly hands over the brush. As things develop very soon there is a queue of boys waiting their turn for the brush whilst Tom is sitting in the shade with a pile of marbles and assorted boyhood treasures. The scene changes to a Saturday morning at Ewelme on a hot sunny day. We are watercress pulling and stacking. A sea, nay an ocean of thick wet spongy green stuff stretches before the four of us GGers. People with dogs stop to watch and chat. I splosh and splash in the shallow water grasping a great armful of the stuff. It comes away easily and smoothly. There is a lovely satisfying cracking sound as dead material breaks off. I gradually work through a narrow passage to the next wooden divider. The water fresh and clean chuckles a bit more free to flow again, odd bits of greenery swirl around and are swept along. A small waterfall giggles over the bricks finding new speed and energy. Gosh, this is great. It reminds me off countless hours on nameless beaches making ditches for the sea to fill or damming streams then diverting the flow of water flowing down to the sea. What fun, what pleasure in simple things! Soon the queue stretches past the pub on the corner, people jostling and fidgeting waiting their turn. An ice cream van appears to do business. Cars are parked way back along the Benson road as the word gets out. I muse on the power of marketing. Well, OK not really that’s in my imagination. As Mark Twain says of another of Tom’s efforts ‘let us draw the curtain of Charity over the rest of the scene’. But maybe we do take for granted a bit the sounds of what we do and the pleasure this gives. Clip, crackle, plop, swirl, trickle, gurgle, they all come in somewhere, sometime. Touch as well, the feel of the tool in your hand, the release as a branch or shrub gives way. The sense of achievement as the water gets through and here a duck and ducklings move out to explore our little cleared waterway. Did Tom get a feeling of achievement when he saw the finished fence? I bet he did when he pocketed his pile of assorted goodies!